The benefits of vitamin C on the immune system have been well documented for a number of years. Vitamin C is crucial to the overall health of the body in its efforts to fight off infections – both bacterial and viral. Recent research has discovered another advantage to ensuring that levels of vitamin C are at the optimum. Recently, at the American Academy of Neurology’s annual meeting, a small French study presented evidence that those people who have normal levels of vitamin C showed a significantly reduced risk for hemorrhagic stroke when compared to those people whose vitamin C levels were deficient or low. Hemorrhagic stroke, while less common than ischemic stroke, is more deadly. Dr. Stephane Vannier, of Frances’ Pontchalilou University Hospital, cited the results of this study as pointing to low levels of vitamin C as a risk factor for strokes of this type. Other risk factors that he pointed out include being overweight, having high blood pressure and drinking excessive amounts of alcohol. Dr. Vannier, and his colleagues, studied 130 people. Half of those people had not had a stroke while the other half had suffered one. Out of all 130 people, 45 percent had vitamin C levels that were classified as being very low. Another 45 percent of the study participants had levels of vitamin C that were normal. Of those 65 people in the study that had never had a stroke, all of them had normal levels of vitamin C.
This French study data is still quite new as it has not yet been through the peer review phase. However, it already corroborates some earlier studies that showed similar results. A University of Cambridge study, undertaken in 2008, showed that participants with high vitamin C levels in their blood had a 42 percent reduction in the occurrence of strokes. Another study, undertaken in 1995 and cited in the British Medical Journal, showed that among elderly people, those with lower levels of vitamin C showed the greatest risk of having a stroke. Recently, a 20-year research project was completed in Japan. 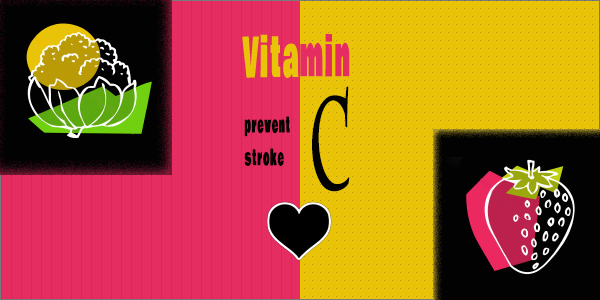 Dr. Tetsuji Yokoyama, an epidemiologist who led the study, stated that his study showed that sufficient levels of vitamin C had positive effects on all types of strokes, including the type that is most common. Of the more than 2,100 participants in the Japanese study, those people who were in the group with the lowest amounts of vitamin C suffered more strokes. Given all the research that points to the plethora of benefits that are possible with the correct levels of vitamin C, it makes sense to enjoy an extra serving of fruits and vegetables whenever possible. Men need 90 milligrams a day while women should get 75.